Spoiler Alert! This book addresses thoughts and themes from the end of this trilogy. 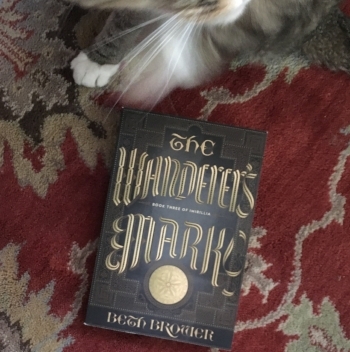 I would recommend reading The Queen's Gambit, The Ruby Prince, and The Wanderer's Mark before reading this blog post. Will there be more Imirillia books? Yes, actually. I didn't think there were any, but as I was finishing up the final drafts I meet a few of the characters and realized there was another trilogy that takes place 40 years later. I know. I know. It drives me crazy when authors do that. But. Trust me. There is overlap of characters, and this is the story to be told. You find out a great deal of what happened in the interim. As far as when these books will be ready? I'm not sure yet. The first draft is in progress, but it is in line with many other projects. Whose death was the hardest for you? Even though I posted a spoiler alert warning, I feel I can't go into specifics here and name names. The hardest to write was the most prolonged death. I cried on more than one occasion over the difficulty of it. Why did the book end there? That night, when Eleanor again found herself wandering into the throne room, a figure was already draped across her throne. When she did not say anything, Basaal spoke. ‘Is that symbolic?’ Eleanor asked. Is the boy whose mother buried him the potter from The Queen's Gambit? The reader has to consider the details and make that decision for themselves. How does the war/battle ultimately affect the psyche of the Aemogen people? Did the essence of the country chance? I can and can't answer this question. I can talk about the battle a bit. But much of this question is answered in the next three books of Imirillia (mentioned above). War in fiction is an interesting thing. I have read a lot of fantasy, a lot of historical fiction, a lot of history itself. War is something one finds on the pages of all three. In junior high, I read everything I could get my hands on from both World Wars, the Civil War, Korea, Vietnam; as well as battles and politics in all the fantastical places I found through fiction. I had the growing sense that while I did not, could not, fully understand what such a thing meant, there was a terrible price demanded from nations fighting nations, people fighting people. While this understanding was growing, I read Lloyd Alexander's Westmark Trlogy at age twelve or thirteen. (Westmark, The Kestral, The Beggar Queen.) In Westmark we deal with war in all it's forms, both from foreign invasion, civil war or sorts, and revolution under a dictatorship. This Trilogy, like some of the best written fiction, showed war for what it was. It was not exploitive. It did not bow to the reader who only wanted the "awesome fight scene". There was no magic. No eleventh hour solution. Some of the most poignant moments of violence in the books are when individuals stumble upon carnage after the brutal deeds had been done. One such moment left me with my hands over my heart, my eyes closed, thinking, "No, no, no!" I later learned that Alexander wrote these books as a way of processing with his experiences as a soldier in World War II. Ah. That made sense, for he brought a maturity, an experience, and a refusal to disrespect by pretending war was a thing to be sought or thrilled by. And his war had consequences. It wasn't without a toll. And the toll wasn't only paid by people the reader didn't care about. I was impressed upon by this thing. When writing of this war, this battle, I hoped that the reader would get a sense of the cost, of the price paid. What was one more loss, she asked herself. - My writing process consists of me getting down a handful of scenes that have flashed into my mind and that I know are part of the story. Then I begin to write sequentially, always interested to find where the already written scenes come into play. A grand game of connect the dots. Because of this, I write scenes and then realize later when I'm writing sequentially why it happened the way it did. My characters clearly know why they are doing what they are doing before I do. One example of this is with a particular character, who when I jotted down a few scenes near the end of the book that I assumed he was in, wouldn't speak. He wouldn't even show up. I couldn't understand why I couldn't access his voice, until I went back to the sequential writing and realized that he had died. - Of all my characters in any of my books, Basaal is the one who has been the most fastidious with how he is represented. He wouldn't leave me alone until I had the scene just right, several times lettering me know that my version of events was not quite how it happened, would I mind changing how something was said? And so I would edit again. He is still that way. In fact, a few weeks ago he flat out told me that I had started the next Imirillia book in the wrong place. I went back and looked at when I'd started the story, and where he'd told me to start the story, and you know what? He was right. Dead right. He always is, and I'm fond of this earnest soul who still graces me with his opinions. ‘And what of joy?’ Seraagh asked the Illuminating God. ‘Is it not to be in this life?’ Seraagh asked. I hoped you enjoyed the journey of The Books of Imirillia! Next week for the Summer Book Club, The Q!